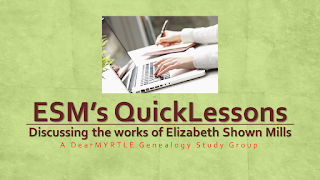 As we approach the 16 March 2016 debut of ESM's QuickLessons Study Group session, we are extending a call for 8 panelists to carry us forward in discussions outlined in DearMYRTLE's 2016 ESM's QuickLessons Study Group. We look forward to reading each assignment and submitting homework in advance of the designated sessions, the dates and links are reproduced below my signature. Note: Although active on Facebook and the Evidence Explained website, the author Elizabeth Shown Mills will not participate in our study group. Interested applicants will complete this form, and the line-up will be announced Saturday, 12 March 2016 during Genealogy Game Night. WHAT'S EXPECTED OF PANEL PARTICIPANTS? Reviewing the Study Group Copyright Guidelines video (below) with The Legal Genealogist, Judy Russell, CG. Although this recording was made concerning a different study group series, the principles remain the same. Registering for each session at http://hangouts.DearMYRTLE.com using a Google Account, as required for Business Hangouts. Note: Viewers may register using LinkedIn, Facebook, Twitter or Google. Logging into the study group session by noon Monday to post the public link to his homework, in blog or Google Doc format, for the following Wednesday's hangout. This is how the moderator, fellow panel participants and viewers may augment their studies of each ESM QuickLesson. Ensuring that you have a high-quality web cam and wired, not wireless microphone. Maintaining wired high-speed Internet access. Anything less will compromise video and sound quality. Arriving at the hangout, using the confirmation email link, 30 minutes prior to the scheduled start of the session, so DearMYRTLE invite you in to the "green room" preparations. Keeping all typed and verbal comments positive and supportive of all concerned. Confining the "mechanical" behind-the-scenes discussion to the private G+ Community created for panelists only. Cousin Russ and I realize we are all at different levels of genealogical research experience. It isn't necessary that each panelist be expert in methodology, citation, analysis, etc. In fact, we try to have a "good mix" of panel participants to make the discussion worthwhile to a variety of viewers.